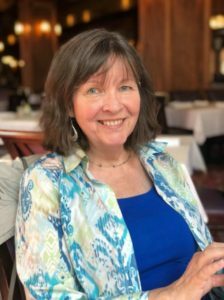 If you are looking to buy a home in or near downtown Los Gatos, but your budget is less than $1 million, you might consider something in the Pueblo de Los Gatos condos community. 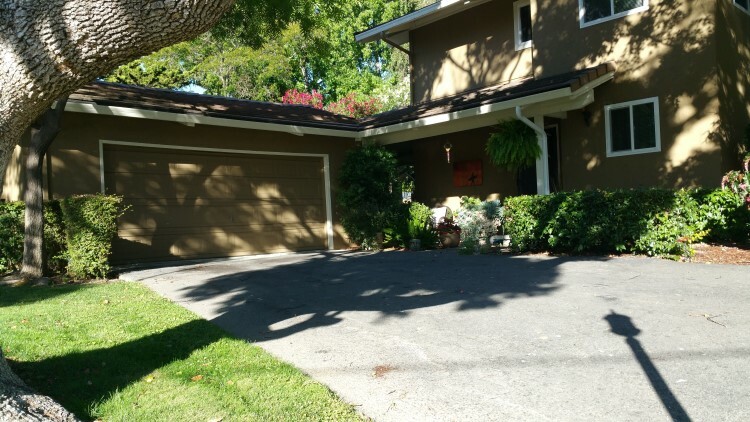 It is one of the more affordable housing options anywhere in town, yet enjoys the highly prized Los Gatos Union School District and a very convenient location. 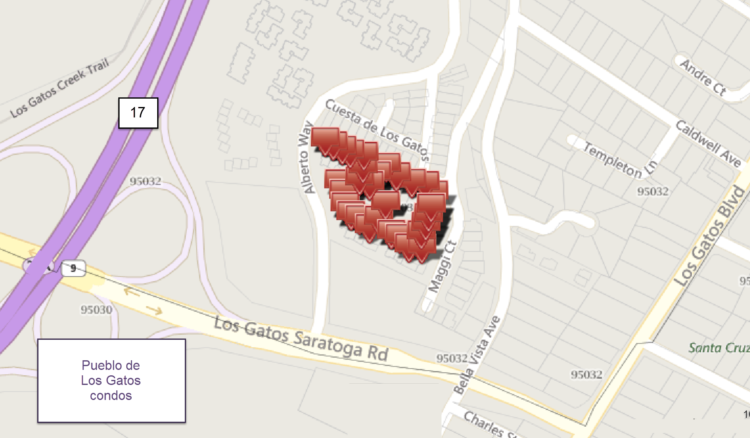 What are homes in Pueblo de Los Gatos like? Front doors face outside, rather than an interior corridor, so this is not a complex that feels like a hotel. The development was built in 1970, and you may detect its age here and there, but overall, it seems to be a well kept up complex. Residents enjoy a community pool and lots of green, open space between the buildings. Several residents appear to have dogs, but on the many visits I’ve made there, I did not hear any barking. The individual units vary in the amount of remodeling which has been done inside. Some still have heat pumps for heating and cooling (rather than a forced air furnace), popcorn or acoustic ceilings, original bathrooms, etc. Many have been beautifully updated, though, so you really need to see each one and take it on its own merits. Gas fireplaces are common – they may be in every unit, but I’m not sure of that. It appears that the units were all built with Zinsco electric panels and subpanels, and they seem to be widely in use (though individual owners may have replaced them). Some home inspectors will raise a red flag about Zinsco or Federal Pacific panels, and others do not say a word about them. Please do your own research on this. Except for one of the homes, which has a garage, all have use of at least one carport space. How big are the condo units at Pueblo de Los Gatos? Pueblo de Los Gatos includes 53 condominium units. I have been in a number of them, and most of the units I’ve seen have good floor plans with very decent space. They have laundry in the unit rather than in an HOA run laundry building. 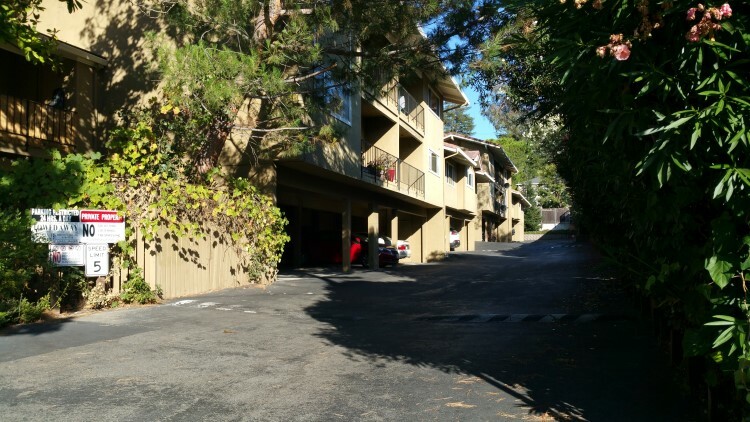 Where is the Pueblo de Los Gatos condominium community located? 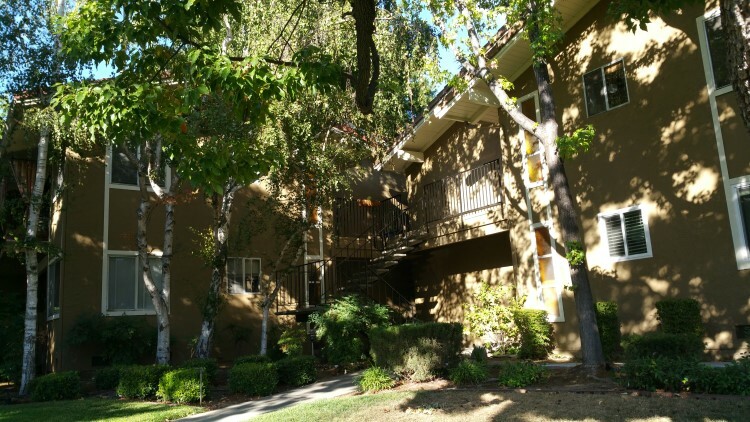 The Pueblo de Los Gatos condos sit at 420 Alberto Way in Los Gatos, near the better known and far larger seniors community, The Commons, and across from a small townhouse community. 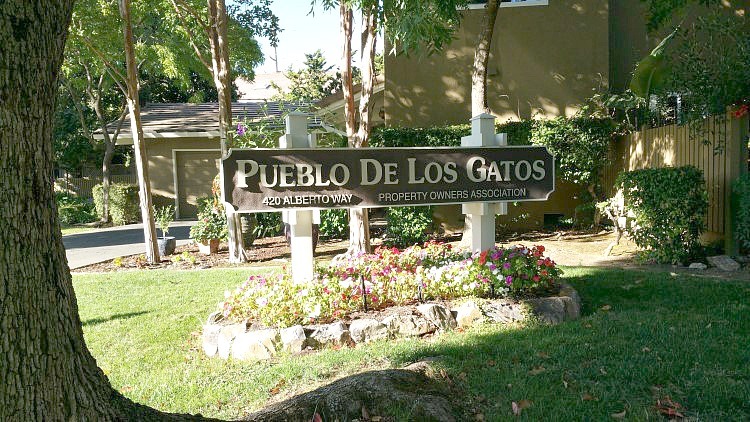 There is a lot of confusion regarding the condos and townhomes along Alberto Way, but to be clear: the Pueblo de Los Gatos condos are not age restricted in any way. How many rentals are in the complex? As of this writing, 32 of the 53 units are owner occupied. Folks buying now will likely have to live in it, and if they want to rent it out down the line, will need to check with the HOA. The owner occupancy rate matters to all owners, as having too many renters will cause downward pressure on home values and make lenders less interested in making mortgage loans on it. Are there any negatives with the Pueblo de Los Gatos condos? There is some noise from Highway 17, which is close (it backs to The Commons). Some units have popcorn ceilings, which may contain asbestos – or asbestos may be elsewhere, and lead paint also, since this is pre-1978 construction. Some units have funky heating, air conditioning, or washer / dryer setups – you’ll have to check each one separately. As mentioned earlier in this article, it’s not a plus that the electric panels are Zinsco, a brand that many consumers would change. Please do your research on that. Personally, I don’t like the idea of carports over living spaces for a variety of reasons, but that may not be a negative for anyone else. See all Pueblo de Los Gatos.